The actual origins of the Dynasty are rather hard to pinpoint with great certainty simply because Babylon itself, due to a high-water table, yields very few archaeological materials intact. Thus any evidence must come from surrounding regions and written records. Not much is known about the kings from Su-abu through Sin-muballit. What is known, however, is that they accumulated little land. When Hammurabi ascended the throne of Babylon, the empire only consisted of a few towns in the surrounding area: Dilbat, Sippar, Kish, and Borsippa. 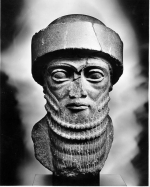 Once Hammurabi was king, his military victories gained land for the empire. However, Babylon remained but one of several important areas in Mesopotamia, along with Assyria, then ruled by Shamshi-Adad I, and Larsa, then ruled by Rim-Sin. In Hammurabi's thirtieth year as king, he really began to establish Babylon as the center of what would be a great empire. In that year, he conquered Larsa from Rim-Sin, thus gaining control over the lucrative urban centers of Nippur, Ur, Uruk, and Isin. In essence, Hammurabi gained control over all of south Mesopotamia. The other formidable political power in the region in the 2nd millennium was Eshnunna, which Hammurabi succeeded in capturing in c. 1761. Babylon exploited Eshnunna's well-established commercial trade routes and the economic stability that came with them. It was not long before Hammurabi's army took Assyria (another economic powerhouse) and parts of the Zagros mountains. In 1760, Hammurabi finally captured Mari, the final piece of the puzzle that gave him control over virtually all of the territory that made up Mesopotamia under the Third Dynasty of Ur in the 3rd millennium. The Venus tablets of Ammisaduqa (i.e., several ancient versions on clay tablets) are famous, and several books had been published about them. Several dates have been offered but the old dates of many sourcebooks seens to be outdated and incorrect. There are further difficulties: the 21 years span of the detailed observations of the planet Venus may or may not coincide with the reign of this king, because his name is not mentioned, only the Year of the Golden Throne. A few sources, some printed almost a century ago, claim that the original text mentions an occultation of the Venus by the moon. It seems to me a misinterpretation because the original texts in the book of Erica Reiner and D. Pingree, The Venus Tablet of Ammisaduqa there is no such sentence. Prof. P.J. Huber's detailed calculations at this point also prefer 1659 for the fall of Babylon, based on the statistical probability of dating based on the planet's observations. He finds the presently accepted middle chronology too low from the astronomical point of view. 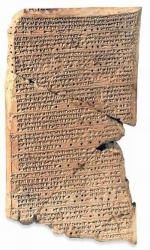 A text about the fall of Babylon by the Hittites of Mursilis I at the end of Samsuditana's reign tells about a twin eclipse is crucial for a correct Babylonian chronology. (The reading of the word Babylon is uncertain but why should a Babylonian tablet refer to another city?). The pair of lunar and solar eclipses occurred in the month Shimanu (Sivan). Professor Peter J. Huber has computed several options that would satisfy the conditions of the detailed description. The lunar eclipse took place on February 9, 1659 BC. It started at 4:43 and ended at 6:47. The latter was invisible which safisfies the record which tells that the setting moon was still eclipsed. The solar eclipse occurred on February 23, 1659. It started at 10:26, has its maximum at 11:45, and ended at 13:04.